Two thirds of a good album, Superunknown contains some of the best artifacts from the dying days of the short-lived Grunge epoch, but it vastly overstays its welcome and with a dreadfully poor back end hangs around to prove why the movement burned itself out . Soundgarden leave a good impression when they unleash enough power to disguise their whiny tendencies, and Superunknown has a solid collection of more disciplined efforts, with vocalist Chris Cornell and guitarist Kim Thayil combining their distinctive sounds to produce the best tracks on the CD. 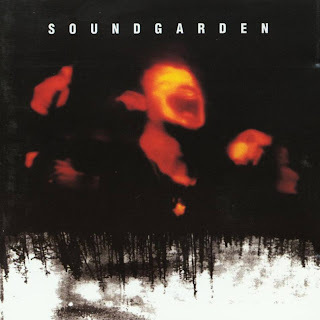 Title track Superunknown is built on a energy-packed circular Thayil riff rotating on a perpetual motion machine, Cornell adding particularly anguished vocals to great effect. Opener Let Me Drown is unafraid to radiate super-heated energy, Matt Cameron on the drums enjoying some of his best moments on the most metallic and up-tempo track. Spoonman is more basic and certainly repetitive, but Ben Shepherd's bass carries enough clout to trample over the weaknesses. Elsewhere, My Wave, Fell On Black Days, Black Hole Sun and The Day I Tried To Live are enjoyable as far as mixing safe commercial rock with Grunge goes, Soundgarden succeeding in being as dangerous as a circus lion. Had the band settled for a 10-track effort, Superunknown would have been a sharp record. But for an unfathomable reason 15 selections make it onto the CD, and the final five tracks are best described as undernourished and conceited filler. A movement that started as a protest finds its own way to an arrogant overkill of empty ideas. Exactly one month after Superunknown was released, Kurt Cobain killed himself. Grunge was already beginning to taste like yesterday's fish, and there was to be nothing ahead but an inexorable decline towards the end of an era. Produced by Michael Beinhorn and Soundgarden. Engineered by Jason Corsaro. Mixed by Brendan O'Brien. Mastered by David Collins.